We predict one of the first industries to fully embrace wireless power in their business is retail. Why? Because retail has an immediate need to optimize the in-store customer experience. This includes pushing innovation to make the shopping experience easier, faster and more integrated with the growing online shopping and delivery experience. Real Wireless Power™ is power that is delivered without cables, plugs, or pads. It is easily adopted as the cost to entry is affordable and the technological advances give clear use cases to reduce costs while increasing or inventing new revenue streams. All of these need to be hardwired, plugged in, charged, or have rechargeable or disposable batteries in order to function. In the case of digital shelf labels (ESL), retailers have always recognized the burden of continuously replacing paper price tags. Yet they have never been able to effectively roll out digital shelf labels (ESL) as an alternative across retail store properties due to the prohibitive wiring that would be needed for a capable ESL system. Planning and wiring new retail spaces to accommodate current and future power needs is not only expensive but also highly rigid and inflexible from a store layout perspective. And batteries are a poor substitute for wires as they deplete and require regular replacement. For instance, retailers limit the usage of battery-powered digital shelf labels to preserve their battery life. Additionally, there are the negative environmental consequences from the disposal of spent batteries. There will be more than 30 billion connected devices by 2020, according to IDC’s Worldwide Internet of Things Forecast Update. That’s a lot of devices that will need power, and retail companies that automate their power needs now will be ahead of the game and agile. Why Will Retail Companies Be Early Adopters of Wireless Power? The primary driver of early adoption is that retail spaces are in a state of significant commercial need to draw more customers into the brick and mortar stores. Real Wireless Power, like Ossia’s Cota®, is much like WiFi, and is managed the same way, too. Retail companies already have IT teams in place that oversee their stores’ and restaurants’ WiFi needs. The same people will seamlessly oversee the deployment and management of real wireless power. Another reason? That competitive edge. Not only will wireless power be attractive to consumers, who will linger in a retail space to gain more power for their personal devices, it will also enable companies to be more flexible and responsive with their digital pricing, product recommendations for upsell purposes and in-store advertising. Here’s a quick refresher on how Cota works. A tiny receiver, embedded in a device like a handheld scanner or electronic shelf label, sends out a small beacon signal that seeks the transmitter. The transmitter can be disguised as almost anything, even a ceiling tile. Once received, the transmitter sends power back through all the same paths from where the beacon was received. The power is only delivered to the receiver’s antenna. This “pinging” process occurs up to 100 times per second, which allows power to be safely sent wirelessly, over a distance, and while in motion. This is the inherent safety of Cota Real Wireless Power. This allows your employees’ and customers’ Cota-powered devices to receive ongoing power without even thinking about, while they work, shop, or dine in the retail space. As this competition grows, retail must find ways to streamline in-store browsing and purchasing and make it more attractive and complementary with new technologies, including wireless powered and Internet-connected devices. 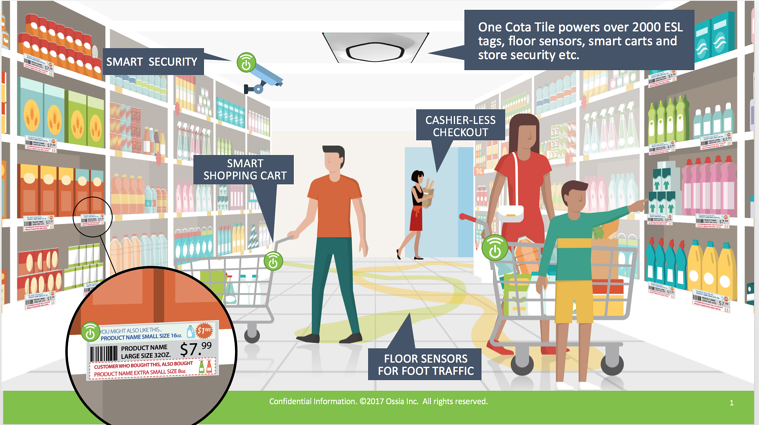 With Cota, the age of Retail IoT is here.